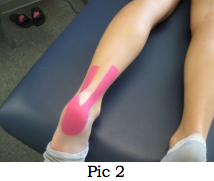 Kinesio-taping is the next big thing all runners should have in their sportsmedicine cabinets. The simplicity and ease of use, combined with it’s powerful benefits make it a near necessity if muscle and tendon health is your goal. the circulation of venous and lymph flows, body temperatures, etc. Therefore, the failure of the muscles to function properly induces a variety of health maladies”. The actual taping is not as difficult as one might think. Although there are certification programs available, in the meantime, a book such as Illustrated Kinesio-Taping 4th Edition by Kenzo Kase, D.C. should get anyone well on their way. In Pic 1, you’ll see that all applications begin by cutting a certain length from a roll of tape. The shapes and widths of the next cut depends on where the application is going. For example, in Pic 2, you can see the achilles is taped by rounding one end that goes under the heel and splitting the other end about 4-6 inches right up the middle that goes along each side of the achilles. The next cut, Pic 3, shows that one end is rounded along the back of the heel, and the other end is split into 3 to go along the base of the foot for plantar fasciitis. A solid strap is then used across the arch of the foot for additional support. Supports Muscles - the repetitive activity in specific muscles used by runners necessitates the ned for support. Improved muscle contraction is important for tired and fatigued muscles, and kinesio-taping helps to reduce fatigue in muscles. It also reduces overextension and over-contraction of muscles, it reduces cramping that leads to injury of muscles, it increases range of motion and for some reason, relieves pain. Activates Endogenous Analgesic System-complicated means of saying it reduces pain. And, through personal, as well as clinical experience, it does. Corrects Joint Problems-as a chiropractor, I must be careful here, as I don’t want some $20.00 roll of tape replacing me. But, the truth is, this is a perfect complement to chiropractic adjustments. Taping reduces spasms and shortened muscles, that cause both pain and misalignments, and normalizes muscle tone and abnormality of fascia in joints. Taping improves joint range of motion and also reduces joint pain. I’ve been treating sports injuries for 30 years. It’s my humble opinion that neither science nor medicine have dedicated enough resources to improvements in either prevention or treatment of structural injuries. We (you and I) live in a “reactive” healthcare industry, yet most of us would prefer to manage our structures and prevent injuries rather than react to injuries. Kinesio-taping allows anyone, everyone, to do a better job at keeping injuries managed. From reduced pain to reduced inflammation to reduced spasms, I don’t remember any product so simple that offers so many benefits. For instructions and to purchase the product, you can find it at www.isokineticsinc.com. This site seems to be less expensive than others. Until next time, hope your running stays injury free.